Dr. Lang releases Vicki from the hospital after warning Jeff, on whom he seems to have dirt, to stay away. At Collinwood, Carolyn’s bite marks have vanished in sync with Barnabas’ cure. Vicki is determined to examine the mausoleum and, with Julia in tow, goes there only to discover Jeff Clark also there, compelled to see her. Together, they intuit the location of the locking mechanism. As the door swings wide, they see the coffin within the hidden chamber. To some, “I just don’t understand” is a cliche. To others, a theme. In either case, Vicki either does (or doesn’t do) a lot of it, and she does (or doesn’t do) it constantly for two years. But times are changing. At this point in the series, with both art and economics dictating the tonal shift to Barnabas, there is far less incentive to make the stories center on her, much less make her Liz’s daughter. After all, how does that connect to Barnabas or the supernatural? Exactly. It doesn’t. Rather than crash the character, it opens up new possibilities. There can be real danger surrounding her because she’s no longer central to the storytelling. The writers flirted before with marrying her off, and unless she marries a Collins, that’s always a threat. But her prior suitors, Burke and Barnabas, would always have the upper hand in the relationship because they understand. It’s their job. Not only do they usually know what’s going on, often they ARE what’s going on. In this sense, can she ever find an equal, and if she can’t, can she really find romance? Enter Jeff Clark. As 468 ends and they peer into the secret room in the mausoleum, we now have a team of outsiders peeling away the mysteries of Collinwood. It’s taken nearly two years, but it feels right. Jeff is an ideal lover for Victoria because he’s more lost than she is (without having significant neurological trauma). Now, she gets to be the caretaker. She gets to collaborate on solutions rather than simply stumble or be led into them. They have more in common than confusion. Collinsport outsiders, both have found themselves beholden to eccentric wealth for pasts that are unclear to them. Vicki is lost twice -- not only are her parents a mystery to her, but since the trip to 1795, so does the very era. Jeff is unclear on his own past, with false memories of untrue guilt layered on top of the fact that he’s destiny’s forgetful time traveler. We won’t really know that until later in the year, so the fact that he’s being gaslit into thinking he’s a murderer so that Lang can steal his severed head will have to do. This episode finishes a week of rebooting, down to taking Carolyn’s bite marks away, allowing Barnabas to be a human hero without lingering consequences of his past misdeeds. Having her as Barnabas’ agent just a few doors down from Cassandra’s bedroom would torture even DARK SHADOWS’ logic. It also resets the character to be available for Adam and Chris Jennings. Happy days all around, and ending with the former heroine confronting the current hero’s darkest secret. Ironic in its timing. Nine months ago, it would have been the TV event of the week. 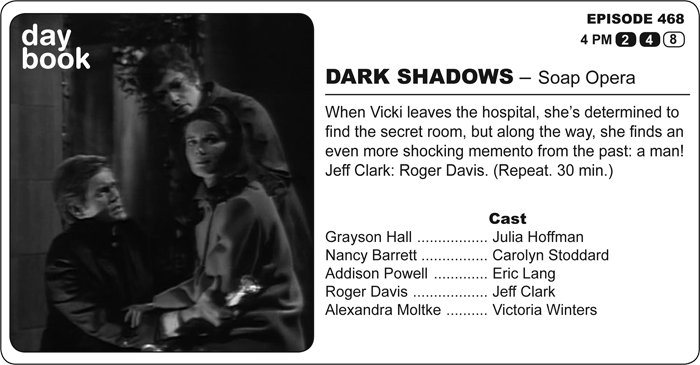 With so much activity on DARK SHADOWS now, it’s just a cliffhanger. Vicki may not understand it, but at least she finally has company. On this day in 1968, Dr. Martin Luther King was assassinated. This episode hit the airwaves April 10, 1968.